The Twins were placed in their forever home together which I think is awesome! A big thank you to Barbara Bryson and family of Klamath Falls, OR. 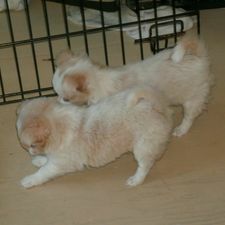 The 2 adorable Male Chihuahua puppies shown below were born June 19,2012 to Tinkerbelle and Sir Rascal. A beautiful litter as always, healthy and active. While puppies are young I spend time holding and cuddling with them, this is all part of the socialization process, and I love it. In the beginning their mommy is taking care of their every need, she will slowly begin spending more time away from them, but the slightest sound brings her running back to check on them. At first they creep, but in the following weeks their legs will become stronger and their vision clearer. The length of their coats will become more evident and coat colors more defined. As you can see in the picture mom (Tinkerbelle), is still protective over her 8 week old pups. I keep puppies with mom until they are at least 8 weeks old. We also socialize them not only with our other dogs, but my grandchildren hold and play with them as well. They are CKC (Continental Kennel Club) registered. By the time they are ready for their new homes they will have had their first shots and will have been wormed and guaranteed healthy. If you are interested in a Chihuahua puppies from Patz Dogs and would like more information just let me know (they do go very fast). I will hold one for a $100 deposit if you wish. Please use the form below, I will get back to you ASAP. Thank you for taking the time to look at our newest Chihuahua puppies, I will update this page as often as puppies are available. 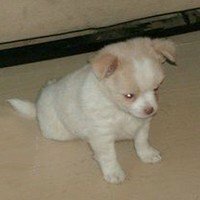 Do you know what puppies learn in the first weeks of their lives.